A birthday is a time to celebrate birth itself with an expression of thanks to God for being born. It is also an occasion to refresh your determinations and rethink your responsibility towards society. It is a great time to reflect on the past, evaluate your present and make plans for your future. 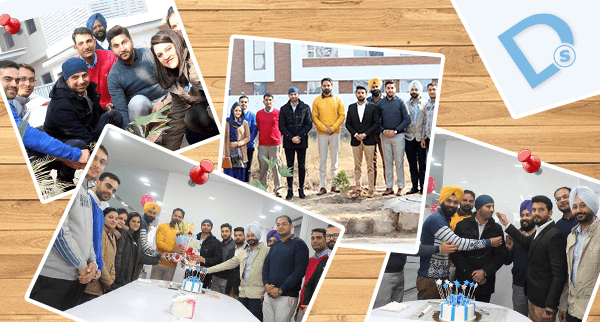 With the same sense of responsibility and realization to understand the utmost needs of the area around, Deftsoft Informatics, celebrated the birth of our honorable Managing Director, Mr. Amaneet Brar by cake –cutting ceremony. To add a valuable cliché that can be reincarnated in our memories, Sir inspired everyone with his thoughts and a clear vision for future development. It is a universal fact that life is beautiful because of the existence of life, itself. The tranquility of land can be cherished and maintained if we care for our motherland. In avalanche to bring positive changes in the industrial area of Mohali (Punjab) where our corporate office is situated, a tree plantation, in the realm to support “#Go Green” campaign was organized. To maintain the cleanliness of roadsides, this was an excellent exercise which we promise to carry forward in the future too. For the overall development of the industrial area, it was a fantastic step towards maintaining a green and pollution free environment. The honorable Managing Director, Mr. Amaneet Brar expressed his feelings to build a neat and beautiful area to spin in the orbit of greenery. He exemplified the awareness of people in other parts of the world to live healthier in a neat and clean environment. Also, he mentioned in his speech that the change starts from an individual which results in big revolutions. With this tremendous social responsibility of promoting healthier workplace by reducing the number of sick leaves, we, the entire team of Deftsoft Informatics pledge to keep our city and environment healthier and clean. We pledge to create a clutter-free environment to make our city a happier place to live by cherishing our immediate environment together as a team!